Foster Wheeler is a global engineering, construction and project management company with 30 offices worldwide. FW serves diverse industries including oil and gas, pharmaceuticals, power generation and chemicals at locations around the world. 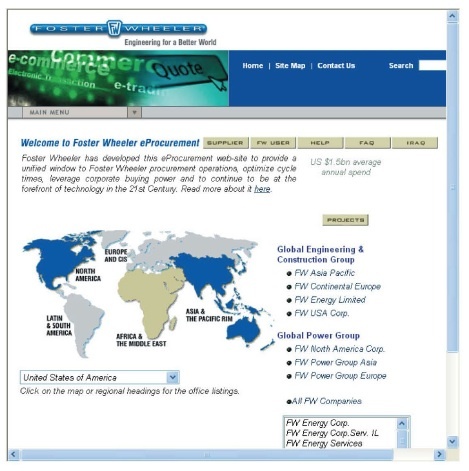 Foster Wheeler’s e-procurement facilities, known as eprocure, have been developed to provide their global procurement organizations with a unified window to carry out their activities, reduce costs, optimize cycle times, leverage corporate purchasing power and continue to be at the forefront of technology in the 21st Century. Eprocure also allows information to be shared so global strategic purchasing decisions can be made, and knowledge pooled for the benefit of Foster Wheeler and their clients. Access to eprocure has become Foster Wheeler’s standard method of operation. The company’s Global eProcurement Team utilized standard Internet protocols and Appligent’s server-based PDF tools to create an automated and secure environment for various procurement activities. Eprocure continues to expand and improve by further developing links to various legacy systems to provide a fully integrated global solution. FW built a Web application that modeled workflow for procurement documents, and integrated Appligent’s AppendPDF and StampPDF Batch applications to facilitate automating the approval process for commitment documents, e.g., purchase orders and letters of intent. The generation of digitized signature stamps was key to ensure commitment documents could be legally enforced if necessary. Signatures are captured by designated personnel. The digitized signatures are then added to the user profiles of those users who need to sign commitment documents. Once the signature files are entered in the system authorized users are able to click on a button on a Web page that activates the server-side StampPDF Batch application which applies the signature to the PDF page. The buyer attaches commitment documents, such as purchase orders in PDF format, and selects the approval workflow. When the buyer submits the commitment document to the signature workflow Appligent’s AppendPDF automatically creates an approval signatures page which is attached to the commitment document. StampPDF Batch applies a purchasing entity stamp to the signature page to identify the operating company that is submitting the commitment document to the supplier/contractor. As each person electronically signs the commitment document their digitized signature is applied to the signature page by StampPDF Batch. The workflow routes the commitment document to the next step in the process. The first person on the list of signatories receives an E-mail notification advising them that there is a document awaiting their signature. They enter the e-procurement web-site and access the documents. After examining the paperwork and the supporting documents the reviewer can approve or reject the request. Stamp-PDF Batch applies the signature of the person approving the document and the next person in the signature list receives an E-mail and so on. “The way the Appligent technology appends the signature page to the original document, making it an integral part of that document provides Procurement with the functionality we needed to meet legal and business requirements.” – Caroline Johnson, FW’s eProcurement Project Manager. The combination of Appligent’s server-based products and internal development resources enabled Foster Wheeler to promptly meet it’s project goals while keeping costs in check. Foster Wheeler achieved 100% ROI within the first few months after implementation. The integral file produced by AppendPDF meets the legal and business requirements of the procurement users. Foster Wheeler is a global organization that provides engineering services and products to a broad range of industries, including the petroleum and gas, petrochemical, pharmaceutical, chemical processing, and power-generation industries. These services include design, engineering, and construction, as well as project management, research, plant operation, and environmental services.